Jailbreaking, Rooting, OSx86, Daily news, Tech Reviews & More! Apple announced the new, fifth-generation 16 GB iPod Touch that costs $229 — making it a bit less expensive than the fifth-generation 32 GB iPod Touch at $299 and 64 GB iPod Touch at $399, both of which were released last fall. Meanwhile, Apple has stopped selling the fourth-generation 16 GB iPod Touch with a 3.5-inch screen, which costed $199. The 16 GB device has a black front and silver back. The 32 GB and 64 GB versions are also available in pink, yellow, light blue, and red. The iPod Touch has been popular over the years. Apple has sold 100 million of the touch-screen iPods since their introduction in 2007, according to blogger Jim Dalrymple at The Loop. If you want to get your hands on the 16 GB model, Apple is selling the new variant in its online store starting 31st May 2013. Although rumors persist that Apple is looking at the development of a cheaper iPhone model to rake in a wider customer base. In an analyst note, Citi Research says the tech giant is heading naturally toward less-expensive models, and this “shift” is considered not only a move toward long-term, rather than short-term, profitability for Apple, but for the tech industry as a whole. Recent image leaks of an allegedly lower-cost, iPhone have surfaced, suggesting that a cheaper, plastic-cased iPhone may also be on its way. Apple has not confirmed that a less expensive iPhone model is in the works, but considering the quiet introduction of a cheaper iPod Touch and the $329 iPad Mini, it may not be an unrealistic expectation. If you purchase the 16 GB version of the iPod Touch, however, you will lose the rear-facing camera. The loss of the camera contributes to the slim design of mobile gadget, which weighs about 3 ounces (86 Grams) and is 4.86 inches tall and 2.31 inches wide. The front-facing camera remains, though it doesn’t have 1080p video recording capabilities. Someone who owns the iPod Touch 4th Generation is very unlikely to ever get used to the absence of a camera. All in all, if you buy the new iPod Touch, you also lose the ‘Loop’ that comes with the 32 and 64GB models of the iPod Touch 5th Generation. If you are looking for an upgrade to your old iPod Touch and want it to be in budget, then you might want to consider this. For more exciting news regarding the world of technology, check Technologic 101 out on Google+ or on Facebook. [Guide] Install WhatsApp Messenger In iPod Touch And iPad. I am sure that you all are aware of WhatsApp messenger. 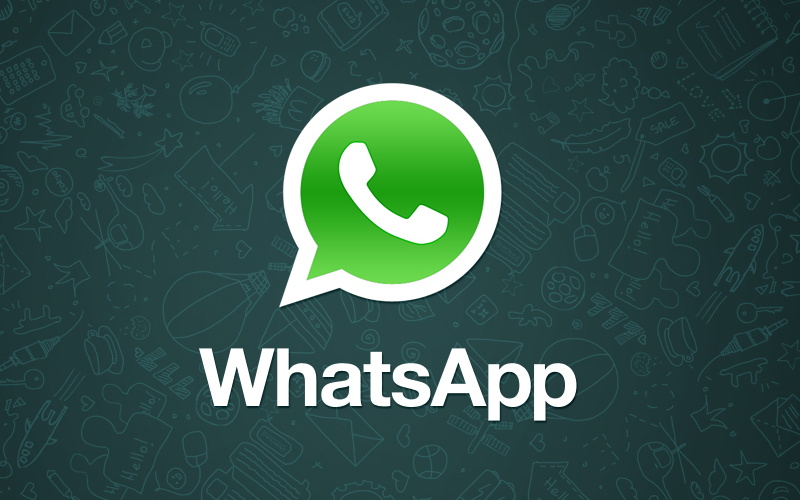 If Not, WhatsApp Messenger lets you Send Instant Messages literally free of cost to other WhatsApp users. Each chat is so small that even the slowest net is enough. WhatsApp cannot be installed on iPod Touch and iPad because its not compatible with it. 1. Open your iTunes and looks for WhatsApp in Apps section of iTunes. 2. Install and open the iPhone Configuration utility before that make sure you connected your iDevice on Windows PC or Mac. 3. Check on the left panel on iPhone configuration utility. Note : The paths mentioned above are default ones, if you changed the path them check the .ipa file there. 4. Check for Devices on the left panel on iPhone configuration utility and make sure your iDevice is listed. Give it some time it will be installed on your deice and you will see the uninstall button next to the app installed. We at T101 do not encourage piracy. 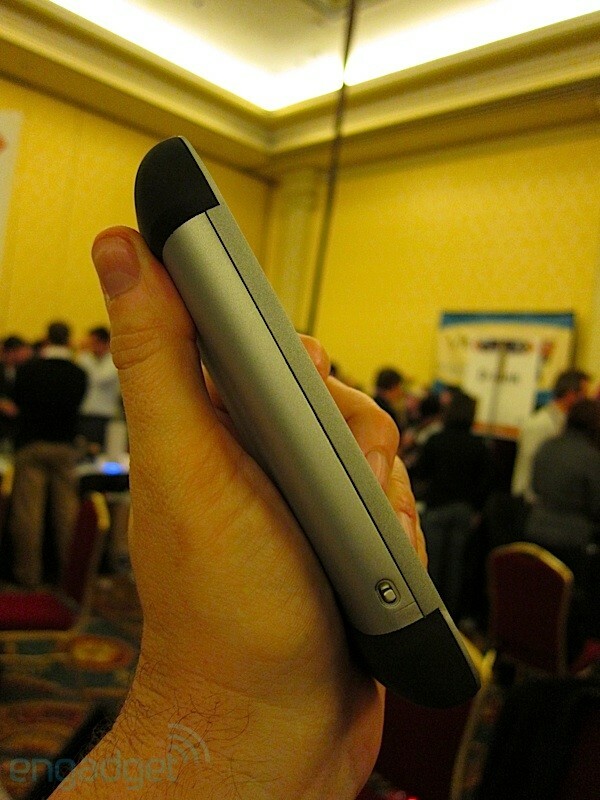 In the 2011 CES, Mophie showed off a prototype of its Pulse game grip for the 4th-generation iPod touch, which features battery-powered front-facing stereo speakers and haptic feedback by Reflex Technology. When one of us at Technologic101 bought it, we spent some time using the Pulse and came away rather impressed. Game audio, music, and even the keyboard tick sound get translated into convincing pulses and vibrations. 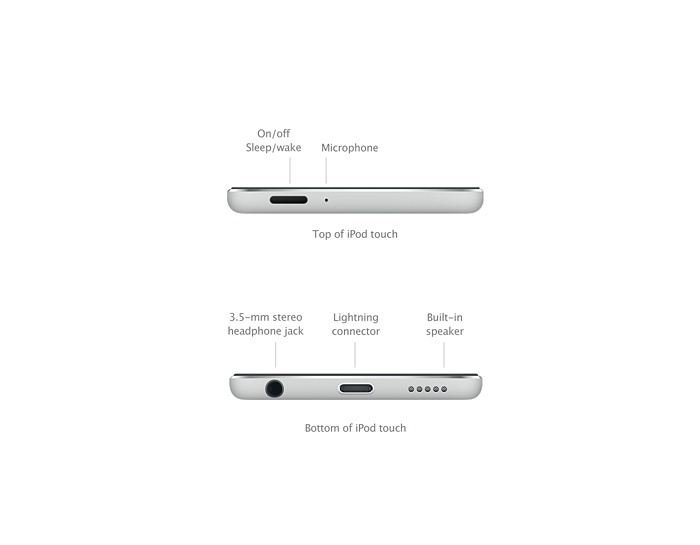 The iPod touch interfaces with the Pulse via the 3.5mm headphone jack, and a switch on the bottom left edge turns the haptic feedback on and off. As a bonus, the Pulse also offers full case protection. The mophie pulse™ is an innovative rumble feedback gaming device designed to give you a new dimension to your gaming experience while playing games on the iPod touch 4th generation. The pulse controller will improve the usability and appeal of all iPod apps – not just games. All effects, such as music, button clicks or scrolling will create a sensory feedback. Featuring ViviTouch™ Technology, the case shakes, vibrates, and pulses, bringing applications and games to life. 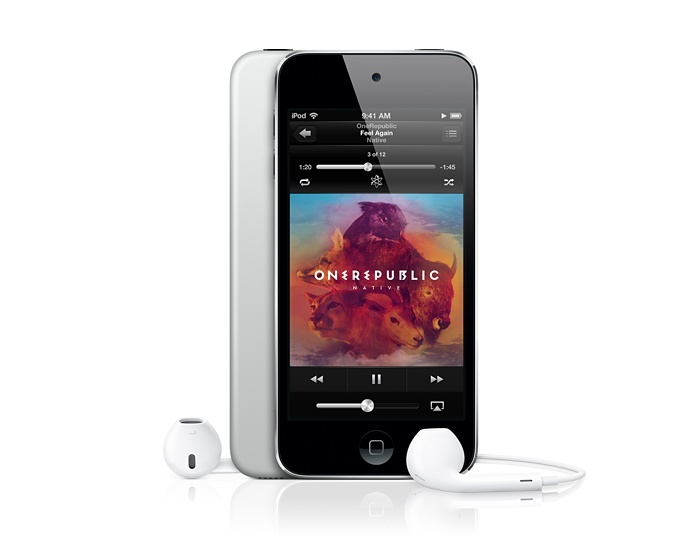 Front-facing stereo speakers enrich the sound quality of the built-in iPod touch speakers, redirecting the sound to create overall bone-shaking game feedback. Additionally, the pulse allows easy access to controls and connectors and features a textured gaming grip on the sides and back of the case to give users ultimate control. It converts electric energy directly into movement and even uses 70 percent less battery power. Developers do not need to use the ViviTouch API to generate vibrations, instead the audio energy from a game is converted to recreate different effects. However, the API is available if Developers want to optimize their games for ViviTouch. 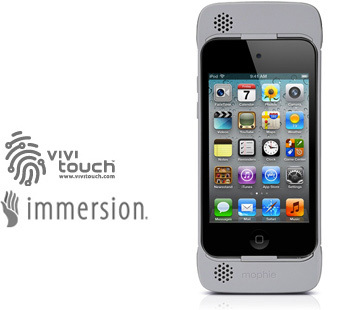 This Product is a must for all users who want iPhone-like gaming experience in their iPod Touch. We hope this helped. Let us know if it did by leaving a comment below! For more exciting news regarding the world of technology,check Technologic 101 out on Google+ or on Facebook. So, lately this new email client (currently only supporting Gmail) for the iPhone/iPod has been a huge topic for discussion in the tech community. Especially it’s ‘first-come, first-serve’ policy which some people are fine with but it irritates others. And we get that. You want to get your hands on the app too like everyone else is. So, what is this policy? Well, the developers for the app are sensible enough manage their servers properly because they know if they didn’t, they would crash and result in a bad review for the app. So, they limited the number of users allowed to use the app. Now, while we think this is smart and an intelligent way to monitor their users, it is also a ‘bad’ thing for people who want to get their hands on the app as soon as possible – for whatever reason. Fortunately, there is a simple work-around for people with ‘jailbroken’ devices to get the app working. Let me guide you through the process. Disclaimer: We are not responsible for any harm to your phone or email account. Also, we cannot assure this method to work when you try to use it as the developers might have just updated the app or their permission protocols.So, try this only if you really want to. Tap on com.orchestra.v2.plist and open it with the Text Viewer. Tap on Edit (upper left corner) and change the last line from false to true and save the file. Make sure Mailbox for iPhone is not open (close it in the app switcher). Then, open up the app and sign in with Gmail. #Update : This method no longer works. We’ll updated the post as soon as we find something that works. Many of us waste time in closing running apps everyday. Double-Clicking Home Button, Pressing Icons and then Closing Them takes a lot of time if you have a lot of apps running. So, I present a solution to all those people who waste their time in closing these apps or people who have a broken home button. The name of the Tweak is SwipeAway and is available in the ModMyi repository(http//:apt.modmyi.com/). 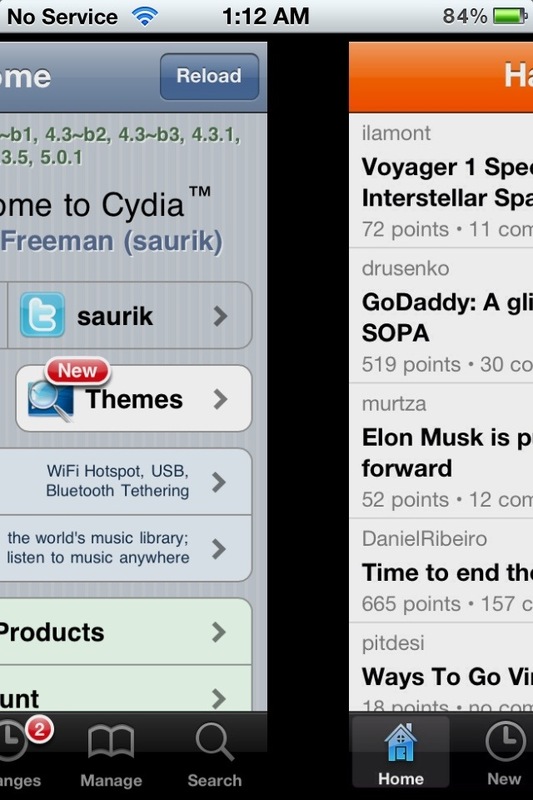 BTW ModMyi Repo is added in your Cydia by default. As easily understood by the name of tweak, SwipeAway is a new app for jailbroken iOS devices that allows you to close all applications running in the background with a simple swipe gesture. SwipeAway closes all applications running in the background on your iPhone in just couple of seconds. How to do it? Simply select a specific activation gesture between those made available in Settings: Swipe up or down, to close all applications. SwipeAway also closes the apps backgrounded by BackGrounder. So,give it a try and keep swinging. One of the most appreciated features of the Apple iPad is its pure multitasking experience. Fitted with superior chips and processors, the iPad is turning into the ultimate device. The iPad family welcomed a new member, the iPad 4. Fitted with the latest A6X chip resulting in faster loading and better graphics. I Cannot Promise you these things but what I can give you is the iPad-like multitasking experience on your Jailbroken iDevice. Renowned Hacker chpwn has released this “cool” Cydia tweak called Zephyr, that modifies the way you switch between applications and enable the multitasking bar. With the Zephyr Cydia tweak you can bring up the multitasking bar by simply swiping up from the bottom of your screen to the top of the screen. Additionally, as mentioned previously, the Zephyr Cydia tweak allows you to switch between applications by simply sliding right to left or left to right on your iOS devices screen. Chpwn will be adding new gestures to the Zephyr Cydia tweak in the near future and this Cydia tweak can be configured from the Settings.app. If you are interested in downloading the Zephyr Cydia tweak to your iPhone, iPod Touch or iPad you can download it from the BigBoss repo for a price of $2.99. For more exciting news regarding the world of tech,check us out on Google+ or on Facebook. All of us are pretty much satisfied with the gaming experience on our iDevices.Games like Temple Run, Angry Birds, Subway Surfer and others have made having iDevices enjoyable.Still, the Gaming on iPods and iPads is still not comparable to our good old PCs. Quake 3 is one of the most popular first person shooters in the world. It kind of revolutionized FPS games. 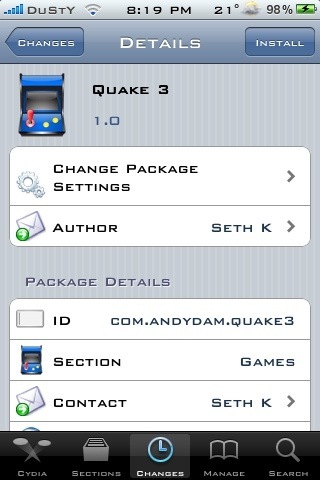 And now it has made its way to jailbroken iPhone and iPod Touch via Cydia. Obviously, this game can’t be played as well on iDevices as on a PC, but never the less, it’s available, and that counts for something. 2. Just Type Quake in the search box. The game was ported on all iDevices. The Game is still undergoing Development but it is still playable.